SP1250LE - J.O. Herbert Co., Inc.
operate in extreme temperature environments of -40oC to +74oC (-40oF to +165oF). 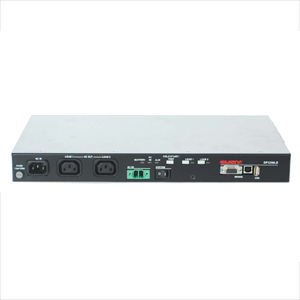 The SP1250LE Universal Power Conditioner is a Power Factor Corrected 875 watt, 1250VA device designed to enhance utility power or repair failing utility power in IT or Security Cabinets. The SP1250LE can also operate as an On-line, Dual Conversion, UPS when the optional battery pack is configured. This optional feature can extend the reliability of the cabinet when the utility power fails (black out) or falters (brown out). The SP1250LE system also protects the cabinet by insuring that no harmful power artifacts arrive at the cabinet to destroy or degrade the cabinet electronics. CLARY’s industry proven on-line, true-sinewave power protects the cabinet 100% of the time to insure reliable and continuous error free operation.